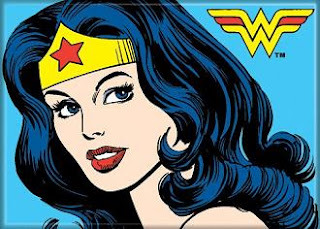 Blue Table Musings: Wonder Woman, I am Not? During the summer at Starbucks, things relax a bit. The store is less busy and even the company seems to want to celebrate the different summer rhythm by providing a fun atmosphere. So, every Friday these past months has been theme day: Hawaiian shirt day, Disney character day, sports team day, and superhero day, just to name a few. This year, I stepped out of my comfort zone and participated in superhero day. You need to understand what a departure from the norm this was for me. This was BIG! I didn’t play dress up as a child. I hate Halloween. I’m not a costume gal. Superhero day? So.not.me. Notice the apron and nametag I HAD to wear. In the past two years, Molly has become a very close friend. To say she has a certain influence on me is an understatement. She's always encouraging fun and helping me be less serious. When I mentioned it was superhero day at work, she squealed with delight. Molly has thrown elaborate Halloween parties and mystery nights, so wardrobe options are abundant, to put it mildly. So I was not surprised when she produced her favorite superhero costume: Wonder Woman. That Friday morning I surprised and delighted some customers with my outfit and disappointed others when I could not produce the Lasso of Truth. For days after, some asked me when Wonder Woman would be making a return appearance. Thank goodness superhero day is once a year! 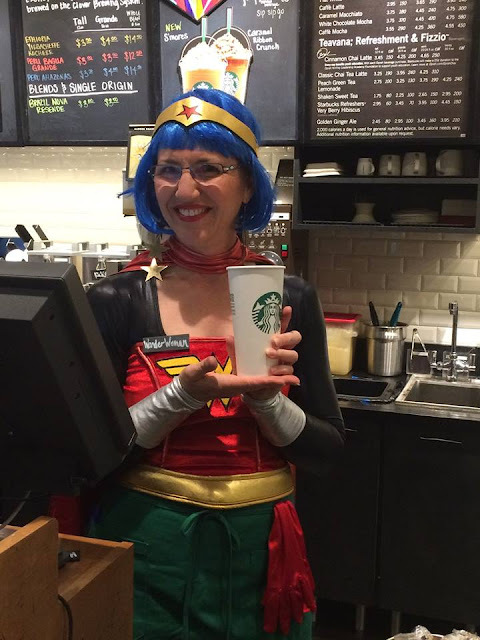 What my customers didn’t know that day (and I’m not sure Molly did either when she handed me the blue wig and red cape) is how fitting the Wonder Woman alter-ego is for me. I have long strived to be my own version of her: a super strong, invulnerable, strategic warrior with mad skills, able to fly (still working on that last one). If you have a problem, I want to be the fixer. The wind in the red cape feels so good! But the reality is I’m NOT Wonder Woman. And although I’ve all-too-often operated like her, depending on my own strength and understanding, slowly I have come to realize that I don’t have any extraordinary ability of my own to rescue, restore, heal, or help those I love. That job belongs to One alone--my Savior, Jesus Christ, and any rescuing, helping, or healing He has allowed me to be part of is because I’ve consciously sought His strength and His wisdom. I am so thankful for those who are superhero-like to me, the dear ones who consistently point me to Him, who help me remember that He alone is my Strength--not just on special Fridays, but every single day. Do you think you need to hang up your red cape?